Last week, I was required to take care of both children by myself for one day during the week between Christmas and New Years—that bizarre buffer week where nobody knows what’s really going on so they end up eating way too many mini-quiches (just me?). “EZ PZ EXTRA CHEESY,” I thought to myself as I put on my dad-hat. I got this. Wrong. I didn’t get this. As soon as Mommy left that day, my two children looked directly into my soul and decided to call mutiny. Right out the gate, the 3-year old refused to brush her teeth and stole an organic ice cream sandwich from the freezer prompting a huge time-out situation and me threatening to cancel Christmas next year. The baby on the other hand was chill until he decided he needed to crawl directly into the dishwasher and play with a fork. He didn’t understand why I took his new favorite toy away. Cue meltdowns. I’ll save you most of the details but it was all downhill from there: spills, tears, and screams. The icing on the cake was when they both boycotted nap-time and the baby decided to start a fist fight with his older sister. Wifey: Hey, I can handle the kids from here. You should go do something by yourself tonight. Wifey: I don’t know. Go see Star Wars or something. Wifey: Yeah you’ve been wanting to see it so go take the night off. I perked up. Since our kids were invented, the last movie we saw in the theaters was the James Bond film, Spectre back in 2015. Her offer sounded great but I’d never seen a movie in a theater by myself before! A million things started racing through my mind: What if I run into someone? What will people think if I’m there solo? Does this guy just abandon his wife and kids regularly on weeknights? Does he have any friends? Shouldn’t he be spending time with his family over the holidays? The tires suddenly screeched in my brain. I reached for my phone, and in 45 seconds, used my two thumbs to book a single ticket for the 930pm showing of Star Wars: the Last Jedi. The energy returned to my core. I was feeling pretty pumped about my impromptu decision until it all hit me like a shot of whiskey to the esophagus. I had forgotten about the biggest concern of them all: WHAT IF I HAD TO GO PEE IN THE MIDDLE OF THE MOVIE? I checked the running time. TWO HOURS AND THIRTY FIVE MINUTES?? PLUS PREVIEWS??? My heart started pumping. I had just signed up for a three hour pee-holding competition. Here’s the deal. I was born with an extremely tiny—nay, efficient—bladder. What makes it worse is that I am a very proficient hydrater—a deadly combination. Because of this, my daily routine is to stop all H2O intake by dinner, so when bedtime comes around the corner, all I have to do is release the dam one time and the reservoir is completely empty. But now, I was gearing up to stay up late. Who knows what my internal systems would think and do? What if my pipes malfunction from all the stress of sitting down in one place for such a long time? What if it all goes haywire?? In addition, I was going out in public alone. What if I have the urge to go before the movie starts but a group of teens hijack my seat while I’m out? My wife wouldn’t be there to stop it and say “oh sorry, this seat is taken.” I’d become conditioned to watching content at home at my own pace. Curse you, Netflix and YouTube. I turned to my wife and shared my internal struggle. “I gave you the night off and all you’re thinking about is pee?” she replied in confusion. I would go into Whole Foods which is right next to the theater. I would grab a quick hodgepodge of food but make sure to pre-pee. There would be no liquid consumption at Whole Foods. Then, I would do a second and hopefully final-pee at the theater before I entered the actual hall to sit down. And if all systems failed, a red alert pee would come only after the lights went dim, so that way, I could use my jacket to save my seat and make a final dash during the 2nd or 3rd preview. After that, my fate would be in the hands of the pee-Gods. 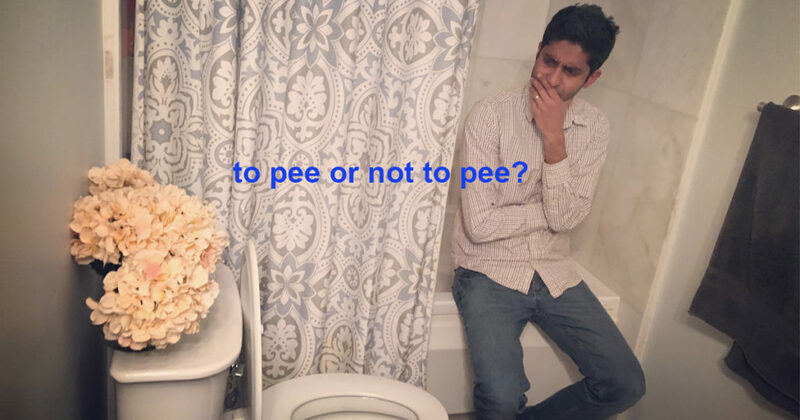 I kissed my wife and told her I would text her bladder-updates. “Please don’t,” she replied as I walked out the door. I started the car. Would this work? Would I be able to pull this off? All I can say is I live by a new mantra now, the 6-P-rule: Prior Planning Prevents Poor Pee Performance. The Last Jedi was dope. I planned for the worst but only needed the final-pee stage for cover. The only downside was that it was waaaay past my bedtime after the film finished and I felt jetlagged the entire next day. But hey, it was the holidays, and more importantly, there weren’t any calamities. I sat through an entire movie, you guys! On my way out of the theater, I had one final thought: why don’t they make bathrooms inside the actual hall of the theater below the seats? And in those “below-deck” bathrooms, they could have the movie running on a few TV screens so people don’t miss anything. Why isn’t that a thing? Can someone tell me why this hasn’t been invented for people like me? Have an efficient bladder strategy? Comment and tell me about it so I can use it! And be sure to follow the shenanigans on Facebook, Instagram, and Pinterest. You can email me directly to say hello too!